How this idea came to be…I have the pleasure of working with the Polymer Clay TV team. They not only produce videos, but have a variety of polymer clay products in their store, and have an extremely active Facebook group – Create Along with Polymer Clay Tribe. 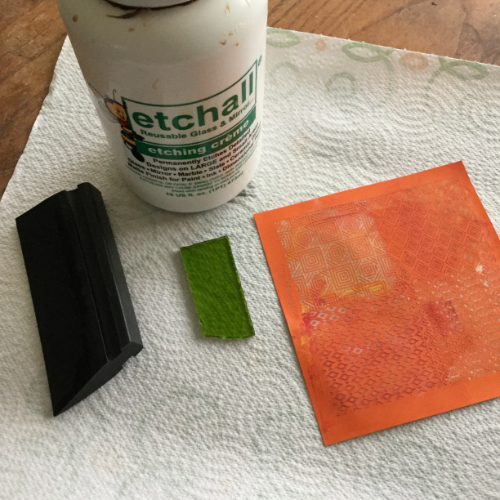 Kira Slye, one of the owners, asked me one day if their silkscreens would work with etchall®, as she knows I like to design using etchall products also! I was intrigued…After a bit of experimenting, I’ve discovered – YES! IT WORKS! I am so excited to try this technique on many additional projects in the coming months. The details you can achieve are well beyond what you can do with a stencil or a die cut element – it’s just amazing! It takes a bit of practice, so I would recommend trying it on some empty bottles or jars you don’t care if doesn’t work out perfectly to practice a bit before moving to the “real” surface you want to etch. 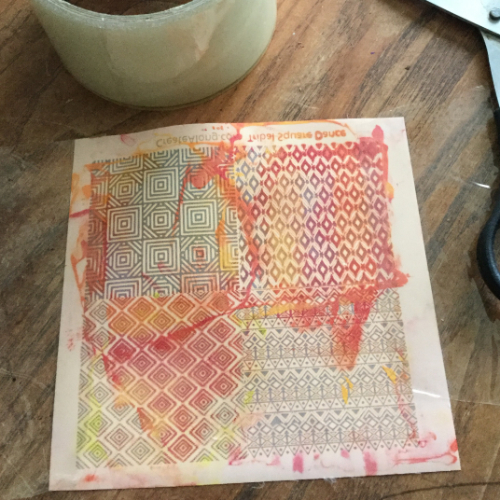 One disclaimer – I have not tried this technique with other brands of silkscreens yet – so I cannot guarantee that they would work. Use tape to secure sides of silkscreen to work surface. As with any silkscreening project, the less “movement” of the screen, the better. CAREFULLY add a dollop of etchall etching créme cream and GENTLY spread with squeegee. Let set 15 minutes. Return creme to bottle (etchall etching créme is reusable! ), remove silkscreen and wash glass. Let dry. Voila! A delicate, intricate pattern of etching on your glass surface. 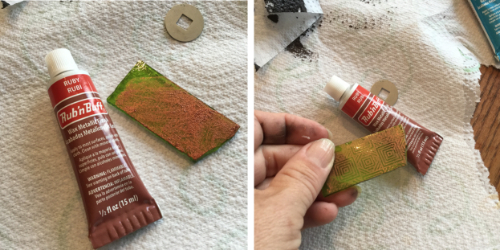 Apply a bit of Rub n Buff metallic wax to surface, gently buff with paper towel to remove from non-etched areas. Your etching is now wonderfully highlighted. Condition Bronze polymer clay. Roll into a cylinder and insert into the extruder. Place the ClayCore Adapter over the clay at the end of the barrel. Add the square disc to the cap, and place the cap back onto the extruder. As you extrude the clay, you will find that the hole is already IN the extruding clay! This makes bead making super easy. 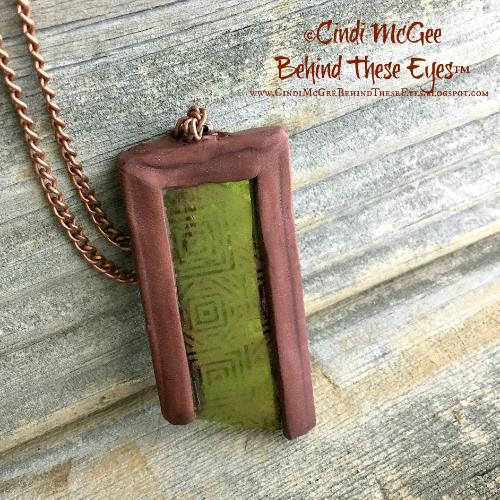 It also gives you the perfect channel for adding a border to the etched glass element. Cutting one end at an angle so the pieces will join neatly when finishing, cut strips of extruded clay to the required lengths to cover the sides of the etched glass piece (I chose to leave the jagged lower edge of this piece open). 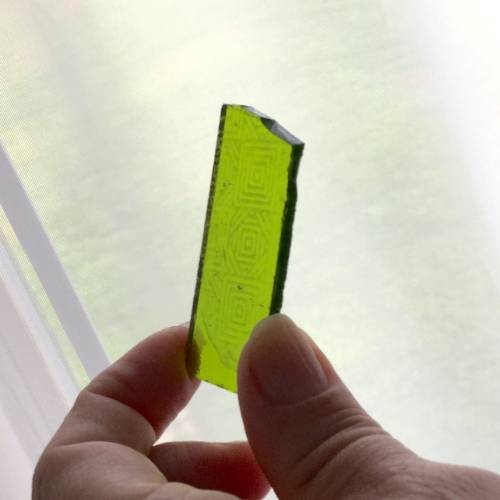 Carefully cut through the center of one side of the square into the opening. Bend eye pin into “L” shape, trim off end. (Tip:I did not have a copper eye pin, but I did have a copper earring wire…so I substituted that!) Add a touch of Bake & Bond and carefully insert into the top, covering and re-smoothing with clay as needed. Bake again. Let cool. 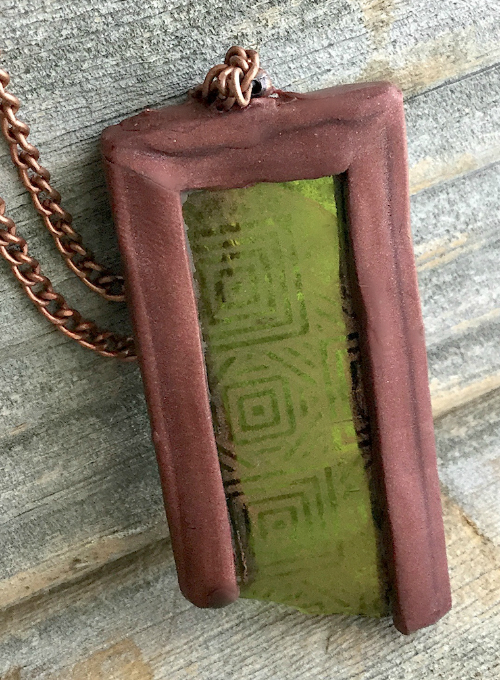 Add desired cording or chain and your unique, silkscreen etched pendant is complete!